Barcelona's defense has been their Achilles heel this season and to an extent, it was due to how we lose control in midfield. Every time opposition set foot in our box, we literally have our heart in the mouth, especially this season. But things have appeared to have turned for the better lately. We looked much more composed against Eibar, despite the constant threats, we simply remained confident in defense. Ter Stegan has kept 7 clean sheets so far this season in the league. Out of those seven five have come in the last six matches. That is no sheer coincidence, it's a sign of a defense which is slowly but steadily getting into their best. And when you consider that we have scored 20 goals during the same period, the impact becomes enormous. Valverde would be pleasantly surprised how a tricky situation involving both Dembele and Coutinho have turned into his favor. With both the players being insecure and not guaranteed a spot, the situation could have turned tricky and affected their morale. But instead, both of them have shown the spirit to fight for their chances. Dembele and Coutinho are different kind of players, and it also gives Valverde an additional weapon when any of them are brought from the bench. At the moment both of them realize that they are not a regular starter and only one of them would be picked. That realization by both players makes it easy for the coach. And the fight they are showing gives Valverde a selection headache, which he always loved to have. Going by the second half of last night match, he may have even found an efficient way of using them both at the same time! 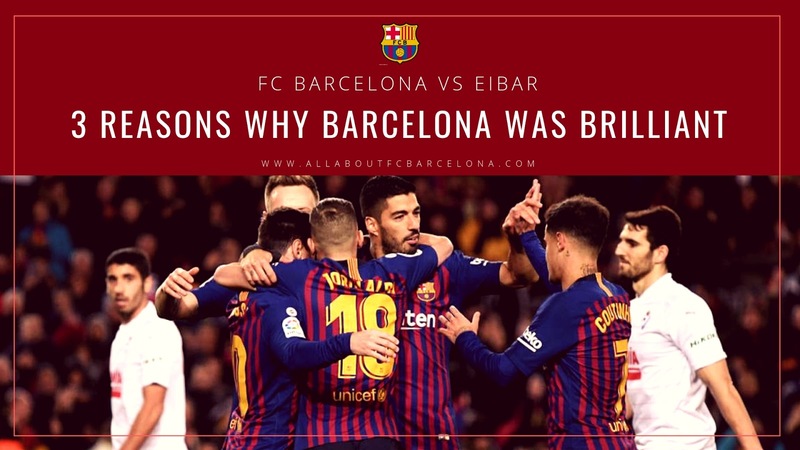 Barcelona was absolutely special against Eibar. They never consumed an ounce of energy more than what was needed to finish off their opposition. We have seen more flamboyant performances from Barcelona, but considering that we have a huge task to overturn a first-leg deficit against Levante mid-week, Barcelona was simply at the most efficient. Buy FC Barcelona v Levante UD Tickets - Copa del Rey at Camp Nou in Barcelona on Live Football Tickets.com. There was a period of fifteen minutes at the start of the second half where Barcelona took the match by the neck and finished it off. After that, the tempo was ramped down and the control was never given up. If the last match against Getafe was an exhibition of the ability to win when not playing in fine form, this was an exhibition of the ability to win by just doing enough. Every ounce of energy conserved this way will help us go a long way!